The practice of White Tara is extremely important to His Eminence Garchen Rinpoche. The practice the Gar Trinley Yongkhyab Ling sangha engage in is called ‘The Refined Drop of Immortality; a Longevity Mandala Practice of Arya Tara, the Wish Granting Chakra,’ and was composed by our groups namesake, the previous incarnation of His Eminence, Gar Trinley Yongkhyab. As per the instructions of His Eminence, and the Venerable Dorzin Dhondrup Rinpoche, the practice of White Tara is central to our sangha. 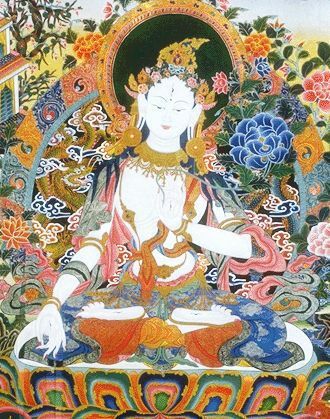 Like any deity practice within Tibetan Vajrayana Buddhism, the purpose of White Tara practice is to realise our enlightened nature -that is, Buddha nature- for the benefit of all sentient beings. As White Tara is a manifestation of the Buddha’s enlightened activities, however, the practice also brings with it the special qualities of longevity and good fortune, as well as being a powerful means to dispel obstacles.